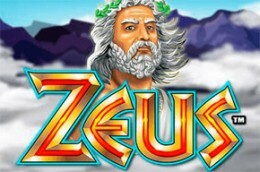 As the name already suggest it, Zeus is an online video slot with a theme inspired by the Ancient Greek mythology. The game is a 5-reels with 30 paylines slot created by WMS Gaming software developer. The game offers you wild and scatter symbol, free spins and cash prizes. The main character of the game is Zeus, the king of the ancient Greek gods. The main symbols are all theme-related and they include Zeus himself, a wreath, a harp, a silver coin, a gold coin, a vase, a helmet, a boat, and Pegasus. The wild symbol is represented by an Olympus icon and the scatter symbol is a lightening bolt.